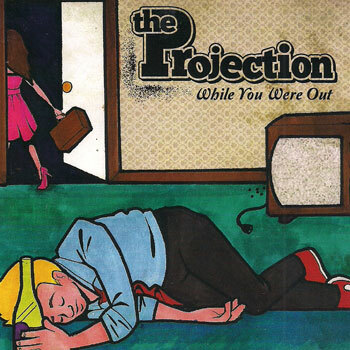 While You Were Out is the forthcoming release from Chicago based pop-punkers The Projection. The disc offers up ten tracks of rock and roll with the catchy hooks and snotty vocals that make pop punk the perennial favorite that it is. The tracks are all clocking in at around the 3 and a half minute mark, perfect for that drive time radio slot, right? The genre isn’t without its flaws though. When your band started years after the Warped Tour, there is a considerably number of acts to compare to. I’m inclined to think they’re like a less cheeky Sum 41 or a slower Goldfinger minus the Ska. That said, the sonic mashup of pop and punk is still rather a new kid on the block and largely still trendy. Despite the flavor-of-the-month nature that pop punk is, this release is not without its own charm. There are some interesting progressions and breakdowns in the tunes that keep it from becoming too stale too fast.